High-quality education isn’t simply restricted to the classroom; indeed, indoor learning alone is ultimately insufficient to fully engage a child’s innate curiosity and imagination. Like many mammals, human beings learn a great deal through unstructured play, and we also have an inherent affinity for natural landscapes and elements. The design and layout of outdoor play areas are therefore crucial factors affecting the fulfillment of a school’s mission. Here we’ll review some of the basics of play-area landscaping—and some of the reasons why outsideactivity is so critical in childhood development. Planning the landscaping for a school’s outdoor play area involves assessing the specific needs and desires of the given institution as well as the existing realities of the available space. Talking with school officials is important enough, but just as rewarding is gauging the desires of the kids who’ll actually be using the facilities. It may seem an odd idea at first to solicit landscape-design help from children, but in this case it’s hugely rewarding. First, you (or the school staff doing the polling) come away with a practical sense of what the target audience would like to see in the finished playground. Second, the more imaginative pipe dreams of your pint-sized charges might inspire your own creative instincts: Even if you can’t arrange to have a stable of flesh-and-blood elephants in the schoolyard (as some ambitious tykes might suggest), you might use full-size interactive animal models to spice up the grounds with an artificial bestiary. Beyond these conversations, you’ll want to evaluate the extant physical environment that you’ll be shaping. Every landscaper knows it’s far easier—and, in a sense, more respectful of the power of a particular place—to work with the landscape than against it. Elements such as trees, shrubs, rocks, hummocks, and walls can actually be excellent anchors for a playground—and can appeal to children as much as the new features you’ll add. Assess the site’s microclimate and prevailing environmental conditions: Which parts receive the most direct sunlight? What’s the drainage? What are the sightlines, and where does outside noise intrude? Depending on the space available, consider installing multiple substrates to zone off the activity area: Children will delight in having different “territories” to explore. In terms of the type of substrate, keep in mind that playgrounds by their nature see a lot of running, jumping, tumbling, and crawling—you don’t want installations that can’t take a bit of scuffing, or those composed of materials that might be too hard or sharp. When considering the arrangement of walkways, walls, and the play structures themselves, remember to scheme everything out from the perspective of a child: What “works” for an adult may not for a three- or four-foot-tall person. 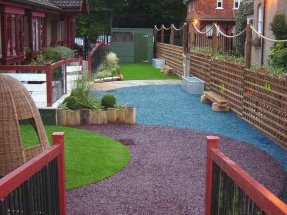 Plantings are immeasurably important for any manicured landscape, and children’s play areas are no exception. A few large trees or hedges provide shade, stimulating structure, and noise-screening; they also serve as ambassadors of the biological world kids can learn endlessly from. Whether it’s watching the seasonal cycle of flower blooms and deciduous foliage or quietly inspecting some bark-crawling insect, vegetation can bring a little bit of instructive wildness into the otherwise highly controlled school environment. Gardens of all kinds can be especially educational, not least because children can assist firsthand in their ongoing maintenance. A vegetable garden teaches young ones how to grow their own food; suddenly, tomatoes or cucumbers aren’t just products magically grown on grocery shelves. A rain garden highlights classroom lessons on sustainability; a native-plant garden provides a real-world introduction to ecosystems and heightens a child’s sense of place. Well-designed play structures accommodate a range of activities and sustain children’s interest over the long-term. From slides to climbing bars, from geodesic domes to playhouses, these should be installations that exercise muscle and coordination while also encouraging creative games and acted-out stories. Rather than configure a structure for a highly specific activity, make it open-ended and multi-purposed—up to the task of nourishing a child’s imagination. A children’s play area is a place for the most free-spirited fun and unshackled imagination. We mustn’t forget, however, that all that levity and spontaneity add up to fundamental intellectual growth. Playing allows children to concoct and act out their own worlds; it allows them to engage with one another and thereby refine their interpersonal communication through real-world trial-and-error. Playing outside, meanwhile, fosters all this in the context of a living environment, an ancestral landscape that speaks to the subconscious and delights the young mind with its elemental atmosphere. In short, the seemingly prosaic setting of the schoolyard is not some afterthought to the real value in the classroom: It’s as meaningful and vital. Proper landscaping ensures it truly delivers an inspiring environment for physical, intellectual, and emotional exercise.